If a disability, from an accident or illness, strikes while one is building a pension plan, the results can be catastrophic. Suddenly, with no income, the disabled can no longer contribute to his or her retirement plan. A disability does not just create immediate financial troubles, the future becomes incredibly uncertain as well. Will a disability put off your client’s retirement? Pension Completion Disability Insurance will ease these concerns so your clients can stop worrying about the stability of their future and focus on the present. If a participant were contributing $1,250 per month from age 40 up to age 65 and was earning 5%, at age 65 the account would be worth $751,702. But if at age 44 the same individual missed three years of work due to disability (average duration at age 44 is 4 years and 4 months) the account would only be worth $632,209, a loss of 16%. This plan can be designed to pay the equivalent of the balance of the contributions anticipated by the participant. The benefit is paid out as a lump sum and is paid directly to the insured. With the guidance of a professional planner the insured may elect to invest the benefit into funds similar to his pension plan or go a different direction such as an annuity, certificate of deposit, or any other discretionary use. 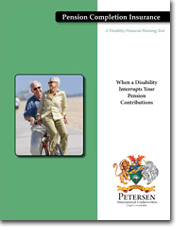 Pension Completion Disability Insurance will keep the disabled focused on the tasks at hand, providing for his or her family and recovering from his or her recent setback.